Jeff Gordon was born in Vallejo, California, which is located just outside of San Fancisco. It would be safe to say, that he was born with the love for speed, or for that matter, anything that might be on wheels. Because at the early age of three, he was biking, skate-boarding and roller-skating. I've even been told, that he was roller-skating down a large hill close to his home at this young age. 1975 - At the tender age of four, he got his very first car, a gift from his step-father, John Bickford, a quarter midget, which only had a length of about six feet, and was powereded by a small one cylinder 2.85 horsepower engine. The little midget racer also had the name "Gordy"
painted on top of it's tiny hood. "Gordy" was the nickname that Jeff Gordon used, and was called by at this time, mostly by his parents and friends. 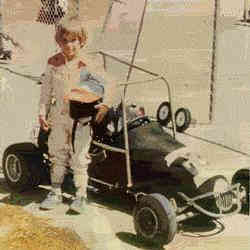 A year later, five year old Jeff Gordon began racing in local quarter-midget races, and the start of a true racer had begun. 1979 - Driving a race car seemed just natural for Jeff Gordon, the truth is, he was too good, he was so good, that by the age of eight, he had won the national champonship for quarter midgets. 1980 - At nine, he moved on to racing go-karts, which were powered by larger ten-horespower engines. He raced in twenty-five races, against teenagers who were twice his age, and WON every race he entered!!! (Some parents were so upset about how he was beating their children, that some thought, that he had to be a midget, or was just not telling the truth about his age.) When Jeff Gordon started racing against adults in go-karts, the results didn't change, he still came out victorious!!! After his second quarter-midget championship, it was obvious, to his step-father and to Jeff Gordon, that he needed bigger and better challenges. unheard-of for any driver at his young age. He won a total of 22 races, set on the pole 21 times and had 55 top 5 finishes. It was also during this time, that Jeff Gordon and his family moved from California to Indiana, because of the no age restriction for race car drivers. Now he could drive legally on Indiana's speedways, but he was still not eligible to drive on their highways. At sixteen, after racing in hundreds of races, Jeff Gordon finally got his racing license from USAC. 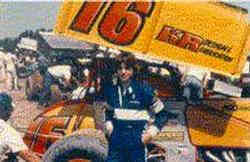 Jeff Gordon was able to continue his education at Tri-West High School, in Pittsboro, Indiana. While attending school, he was still able to improve on his racing career, and even though his racing career took up many of his nights and almost every weekend, he somehow still found the time in his busy schedule to study and keep his grades up. Also while at school, he took the drivers education course, which is kind of humorous, considering he had already won well over a hundred races at that time!!! With his racing career moving at a astounding fast pace, he found he was quickly becoming a famous race car driver, but even with his new found fame, he tried to keep a low profile at school, keeping most of his racing accompishments to himself when possible. He enjoyed high school sporting events, attending as many as he could, always cheering for his school's teams. He also was quite popular among fellow students, being voted king of his senior prom, but his passion for driving a race car, always came first for Jeff Gordon. His love for racing was so great, that he elected to enter a race on his graduation night. After school Jeff Gordon began racing full time. 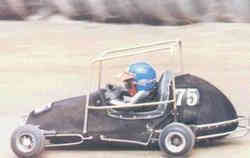 At the age of nineteen Jeff Gordon won the UCAC National Championship in the midget-car class. 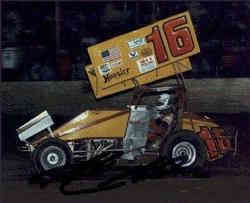 At twenty, he won the USAC National Dirt Track Championship, the youngest driver ever to accomplish this feat. More important to us Jeff Gordon fans, was that two years prior to winning the USAC championships, Jeff Gordon drove his first stock car. He went to a driving school, that was run by Buck Baker (former NASCAR driver, now considered a legend). By the end of first day at Rockingham Motor Speedway in North Carolina, Jeff Gordon was hooked. "This is it!!! This is what I want to do for the rest of my life!!!" he exclaimed. finishing most races in a very unusual position for him, near the back of the racing pack during his early races, but things were about to change for Jeff Gordon. After being in the Busch series for a short time, Jeff Gordon met his future crew chief, a man named, Ray Evernham. At first thought, the older and more experienced Evernham wasn't real sure if he wanted to work with such a young driver, but after meeting, within a short time, Jeff Gordon and Evernham did hit it off, and what a team they made, because sooner than most ever thought possible, they became a winning combination. By the end of the 1991 season, Jeff Gordon had won the Busch Grand National Series Rookie of the year, and he also took home more than $100,000 in prize money. Jeff Gordon now felt ready to leave the Busch League and enter the Winston Cup world, the top series of all NASCAR sanctioned events. Chevrolet, they are quicky nicknamed the "Rainbow Warriors". Jeff Gordon started his first Winston Cup race in Atlanta and he finished in the back of the field, with a unimpressive thirty-first place. This race also happened to be the very last race for the "King" Richard Petty, the driver who holds the record for the most NASCAR wins ever. Looking back on this race, it seems like the torch had been passed from one great legend to a future one, the "Wonderboy" Jeff Gordon. 1993 - Jeff Gordon started his first full season of Winston Cup racing with a bang!! He won the qualifier for the Daytona 500, and this was the first time in three decades that a rookie had accomplished such a feat. He also finished the Daytona 500 with a very respectable fifth place finish. Although he never won a race in his rookie year, he had enough points by the end of the season, to be honored as being named the Winston Cup Rookie of the Year. 1994 - This year, would be the year when Jeff Gordon was to record his first Winston Cup victory, the Coca-Cola 600, in Charlotte, North Carolina. He showed the NASCAR world just how much this victory meant to him, as his eyes filled with tears of joy when he crossed over the finish line. Within six weeks of the Coca-Cola 600, the inaugural Brickyard 400 was to be run at the reknown Indianapolis Motor Speedway, home to the world famous, Indy 500. It was to be the biggest NASCAR racing event in years. Jeff Gordon who had just celebrated his twenty-third birthday two days earlier, WON the Brickyard 400 race by just half a second!!! Overnight, Jeff Gordon had become a household name among racing fans, and had also become NASCAR's new stock car racing superstar. 1995 - Jeff Gordon followed the 1994 season, with an absouletly incredible year in 1995. At the age of twenty-four, he won seven races, took home over $2 million in winnings, and became the second youngest driver ever in the Winston Cup series to win the highest achievement in stock car racing, the Winston Cup Championship!!! 1996 - The 1996 season was another super year for Jeff Gordon. He won over $3 million in prize money, and he came in second in the Winston Cup championship points race. Only losing out on winning his second title by a few points, to his team-mate Terry Labonte. 1997 - Jeff Gordon, at the age of twenty-five, became the youngest driver to ever win the most sought after and prestigious race in all of stock car racing, the Daytona 500. He ended the season by narrowly winning his second Winston Cup Championship, and also by winning more than $4 million in purse money. For the second time in three years, Jeff Gordon was named the greatest stock car driver of the world. Jeff Gordon wanted even more, he wanted a piece of history, and he got it, with his season-ending victory at the NAPA 500 at Atlanta Motor Speedway. The three-time Winston Cup Champion ended the 1998 season in true style, by getting his 13th victory in Atlanta. This tied him with "King" Richard Petty's modern-era record for the most wins in a single season. The record was established by Petty in 1975. 1999 - Some people say that Jeff Gordon had a terrible season in 1999, but if you look at his stats, you have to wonder if they know what their talking about, he had a series-leading seven wins, 18 top-5s and more than $5 million in prize money. He also won the Daytona 500 for the second time, and he swept the two road courses. 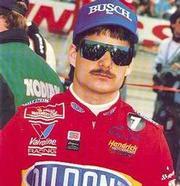 But I guess by Jeff Gordon's staggering standards since 1995 it really was a semi-disappointing year. For the first time since 1994, Jeff Gordon finished lower than second in the points standings and the seven wins were Jeff Gordon's lowest total since 1995. But the one thing that seperated this season apart from the usual Jeff Gordon season we have become use to, and perhaps was worst of all, Jeff Gordon failed to finish six races, which was more than he had in 1997 and 1998 combined. Besides being an off-season for Jeff Gordon, their were some major changes in the organization midway through the season, the most notable change was the departure of long time crew chief, Ray Evernham, who departed to form his own team with Dodge, and with the departure of Evernham, some of the pit crew, known as the "Rainbow Warriors" moved on to another team. But their's one thing about Jeff Gordon that remains true, the three-time Winston Cup Champion has not forgotten how to race. When he was good in 1999, he was the best!!! He led the most laps in six different races and won from the pole twice. So if you are one of the few who have written Jeff Gordon and the DuPont #24 car off, you better think again, because Jeff Gordon will be back on top, for many years to come. 2000 - With newly hired crew chief, Robbie Loomis, who came from the Petty organization, and a almost completely new pit crew, Jeff Gordon started the 2000 season with optimism and high hopes, but the team wouldn't start the 2000 season like it had hoped, they had poor finishes at Daytona, Las Vegas, and Texas. The team also struggled at tracks. were they had in the past dominated, Darlington, Pocono, and Martinsville. In 2000 we saw Jeff Gordon add another highlight to his career, he won his fiftieth career race!!! The win came at Talladega, and with this win, we also saw the Dupont team slowly coming together. The team picked up it's second victory on the road course, at Sears Point, and with this win, Jeff Gordon set a Winston Cup record for consecutive road course wins, with six!!! The win was also a big lift in moral and confidence for the team, but it was short lived, because the team followed the win with a four race stretch, in which Jeff Gordon failed to produce not one top 20 finish. The month of September brought the team renewed enthusiasm, they got their third win at Richmond, and Jeff Gordon followed that win, with 10 top 10's in the last eleven races of the 2000 season. With the strong finish the team showed in the last part of the 2000 season, could the rebuilding be over? Will we see Jeff Gordon in 2001 making a strong run for his fourth Winston Cup Championship title? 2001 - 2001 was quite a year for Jeff Gordon, at the young age of 30, he won his fourth Winston Cup Championship, making him the youngest driver ever to win four Winston Cup titles, and in doing so, he also became only the third driver in Winston Cup history to win more than three championships. He also set a new single season record for earnings in 2001, he won $10,879,757, making him motorsports' all-time money winner. He finished the year with six Bud Pole Awards, which was the most in the series. He won The Winston all-star race for the third time, tying the late Dale Earnhardt for the most wins in that event, and he also won his third Brickyard 400 at Indianapolis Motor Speedway. Will the 2002 season be as exciting as this years? Who knows, but I wouldn't miss it for the world!! !